The International team won three of Friday's fourballs to cut the USA's lead in the Presidents Cup to 5.5-4.5. The USA had led 4-1 overnight at the Jack Nicklaus club in Incheon, South Korea, following Thursday's foursomes. But the defending champions won just one match on day two, while Phil Mickelson and Zach Johnson controversially halved their match. The pair were handed a one-hole penalty after Mickelson illegally changed the type of ball he was playing mid-match. The competition continues on Saturday with foursomes and fourballs. Mickelson and Johnson were all square through six against Jason Day and Adam Scott when the five-time major winner switched to a harder ball to get extra distance from the tee going into the par-five seventh. Mickelson teed off but thinking he may have broken a rule he consulted US captain Jay Haas and a referee, who raised the issue with the rules committee. They informed Mickelson he had breached the rules and he was disqualified from the hole as Day carded a birdie to put the International team one-up. But officials then realised they had incorrectly applied the penalty and the proper sanction was the 'adjustment' of one hole, meaning the US went two-down. Despite being incorrectly disqualified Mickelson was denied the chance to go back and finish the hole. "The weird thing was I've never heard of a match adjustment penalty," said Mickelson, who has played 49 matches in the 21 years since the Presidents Cup began. 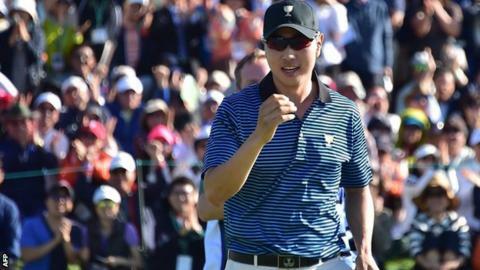 Home favourite Bae Sang-moon sank a 12-foot birdie putt as he and partner New Zealand's Danny Lee beat Rickie Fowler and Jimmy Walker by a hole. Louis Oosthuizen and Branden Grace beat Dustin Johnson and Jordan Spieth 4&3, with Thongchai Jaidee and Charl Schwartzel edging out Bill Haas and Chris Kirk 2&1. The defending champions' sole fourball triumph saw JB Holmes and Bubba Watson go two-up on Marc Leishman and Steven Bowditch. Bae, who is making his Presidents Cup debut, said: "I was really desperate to help out the International team and after the last shot on the 18th hole today I was very happy. "I felt like I did something for the team and I also created momentum for the other players, so I was very happy and it was a very thrilling moment."